I ask people all the time, “How many of you are sick and tired of all the praisings you get at work?” I always get the same response—laughter. It’s sad how many managers spend their time pointing out things that are wrong with performance instead of catching people doing things right. That’s why Spencer Johnson and I encourage you to focus on the Second Secret of The New One Minute Manager®, One Minute Praisings. After you have set clear goals with someone, it’s important to spend a good amount of time with that person to make sure they are set up for success. 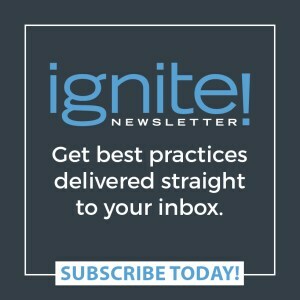 In fact, let people know you’re going to give them lots of feedback on their performance because you believe in their talent and you want them to be high performers. If they aren’t used to receiving much feedback it might seem confusing, but soon they’ll realize what a valuable tool it can be. When you praise performance, remember to do it promptly and be specific about the behavior. Let the person know how you feel about their achievement and encourage them to keep up the good work. This is especially true when someone is working on a new skill or task, because praising will help build confidence. As people become more proficient, they will actually learn to praise themselves for a job well done. Something to keep in mind: a One Minute Praising is not the same as flattery. It’s a statement that builds trust and improves communication because it’s based on facts and data. Saying “nice job” isn’t specific enough to build rapport. But if you say, “Sally, thank you for getting your monthly report to me on time. It provided accurate information and allowed me to meet my deadlines. Keep up the great work,” it clearly states your appreciation and will boost Sally’s morale. 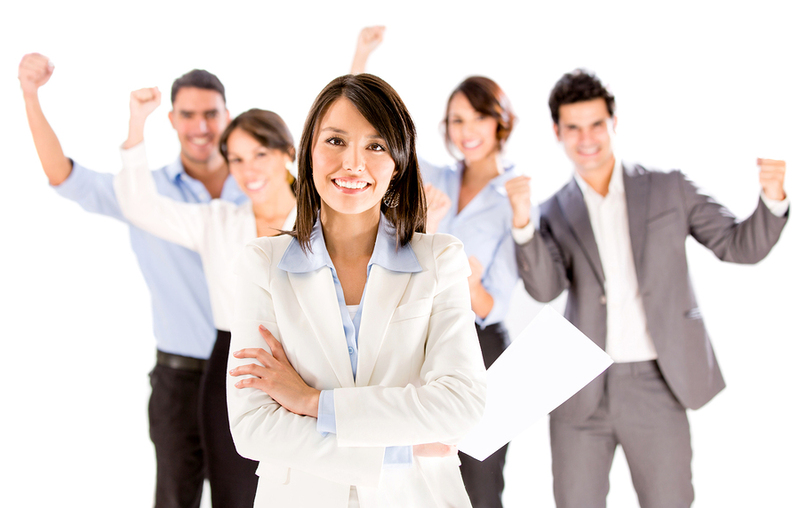 It will also help her realize she is an important member of the team and improve her productivity overall. So spend a few minutes every day catching your people doing something right. It doesn’t take much time. Remember: the best minute of the day is the one you invest in your people. 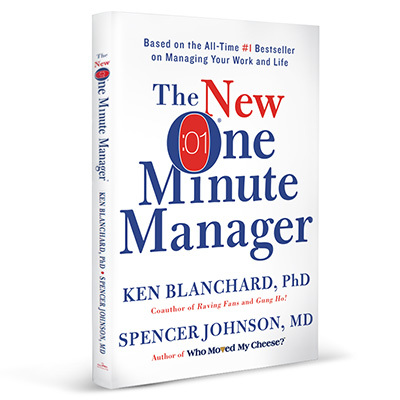 To learn more about The New One Minute Manager, visit the book homepage where you can download the first chapter. Are you ready to learn about the next key from my new book, Refire! Don’t Retire: Make the Rest of Your Life the Best of Your Life, coauthored with Morton Shaevitz? As a reminder, the first key, Refiring Emotionally, is about creating a work environment where people can be engaged. The second key, Refiring Intellectually, suggests the need for lifelong learning. Now let’s consider the third key—Refiring Physically. Numerous articles have been published about the positive link between physical exercise and improved mental outlook and job performance. 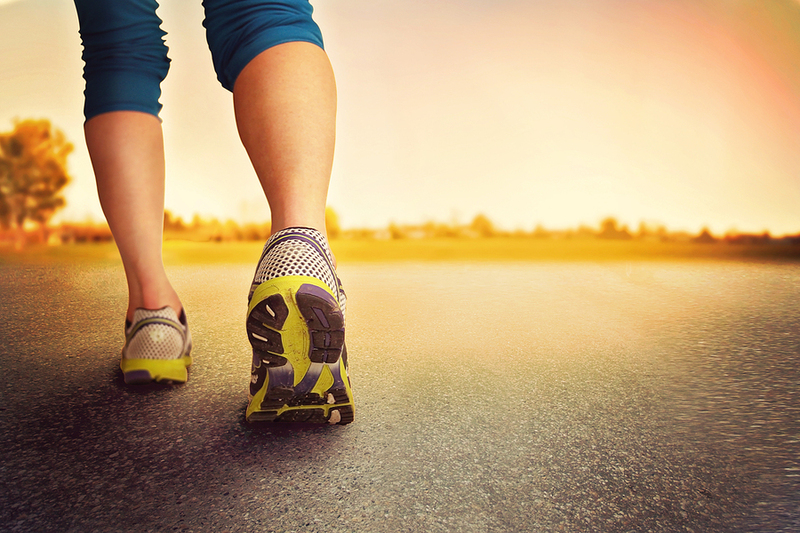 Smart companies realize that employees who exercise are more productive and engaged. Many HR departments offer wellness programs such as exercise facilities in the building, discounts to a gym, or a hosted yoga class or walking club. And it never hurts to get creative—encourage people who sit at a desk all day to get up every thirty minutes to walk or stretch to get their blood pumping. Hold meetings where everyone stands up. Walk down the hall or to the next building to talk to someone instead of e-mailing them. Take the stairs instead of the elevator. Exercise doesn’t have to be a carefully planned, timed activity—it can be anything that gets you up and moving, even for a few minutes. Through the years as our company has grown, our headquarters has spread out little by little until we now occupy several small office buildings on our street. A few years ago we created a natural walking path that goes around the buildings. I’ve noticed that our “Blanchard Trail” gets quite a bit of use. Some people walk in exercise clothes so I know they are working out, but others wear work clothes and are just taking advantage of a nice way to get reenergized. Some have told me they even hold one-on-one meetings while walking on the path. A short walk in the fresh air can give anyone a new perspective and help them be more effective on the job. The health benefits are an added value. So get up and move! And spend time to keep your employees healthy. 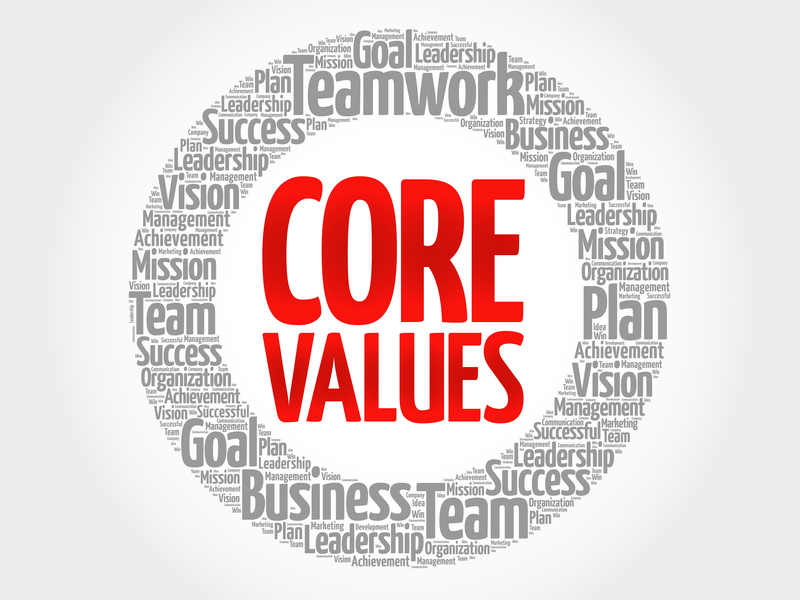 It’s an investment in the vitality of your entire organization. To learn more about Refire! 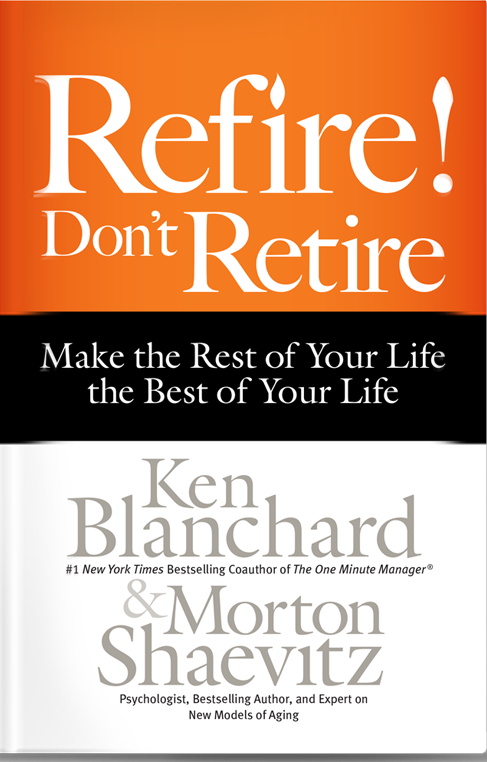 Don’t Retire: Make the Rest of Your Life the Best of Your Life, visit the book homepage where you can download a free chapter. I’ve written more than a few books over the years, but I still get excited when a new one comes out. 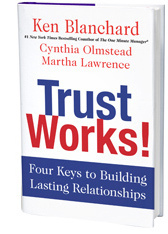 We’ve just released a new book I coauthored with Cynthia Olmstead and Martha Lawrence called Trust Works! Four Keys to Building Lasting Relationships. We think it will make a difference in people’s lives while giving them a smile. The first part of the book is written as a parable about a dog and a cat and how they learn to trust each other. It’s interesting—we asked people for feedback on one of our first drafts, and some dog lovers were offended because it seemed as if the dog had to do all the work to get the trust from the cat. We realized that we needed to emphasize that trust is a two-way street. So in our finished story, not only is the dog trying to get the cat to trust him, but the cat has to get the dog to trust her too. Of course, the story is a metaphor for any relationship where people need to create and build trust with one another. Readers will be able to apply it to their working relationships as well as their relationships with family and friends. Cindy Olmstead spent years developing the wonderful ABCD Trust Model™ we use in the second part of the book to highlight the four behaviors that need to be present in order to build trust. If even one of these behaviors is absent, trust erodes. First, you have to prove that you’re Able. You are competent to solve problems and get results. You strive to be the best at what you do and you use your skills to help others. Next, you have to be Believable. You act with integrity and honesty. You show respect for others, admit your mistakes, keep confidences, and avoid talking behind others’ backs. You also have to be Connected. You care about others, which includes showing interest, asking for input, and listening. You praise the efforts of others and share information about yourself. Finally, you need to be Dependable. You do what you say you will do. You are organized and responsive. People know you will follow up and be accountable. How would you assess your trustworthiness in these four key areas? Go to http://www.trustworksbook.com and take the self-assessment. While you’re at it, ask the people you work with to evaluate you as well. That’s how I learned that my lowest score in these four areas was in the Dependable category. What an eye opener! I never thought of myself as undependable but since my executive team and I understood the four factors, we were able to have that conversation and zero in on the problem. Turns out that my desire to please everyone showed up in real life as a tendency to over-commit myself—which resulted in people ultimately being disappointed because I couldn’t meet their expectations. Using the ABCD Trust Model™, my team came up with a great solution for me. Now when opportunities come up, instead of saying yes without thinking, I hand out my executive assistant’s card so she can make sure I have the time and resources to follow through. As a result, my Dependable score has soared! In most organizations, trust issues are simply avoided until they reach a breaking point. You can’t just assume that trust will grow over time—sometimes the exact opposite happens. Trust is hard to define. You can tell when it’s absent—but how do you create it and build it when it doesn’t exist? Trust Works! provides a common language for trust—and essential skills for building, repairing, and sustaining it. Building trust is one of the most needed skills for leaders today. Don’t leave trust to chance in your organization. With spring around the corner, I find my mind turning to golf. I love to play golf. I’ve always tried to not take it too seriously and remember that it’s just a game—but I didn’t really love to play until I started to use an approach called NATO golf. In case you haven’t heard of it before, NATO stands for Not Attached To Outcome. When you’re attached to outcome, you might be having a good game but then you hit the ball wrong and find yourself focusing on the wrong things—every move you make, every breeze, every bump in the grass. It really tightens you up and you can’t perform as well. You become fearful of your results because you believe that who you are depends on how you score or play that day. I can’t tell you how much more fun it is to play NATO golf than to grind my teeth over the score. It doesn’t mean I’m not interested in hitting good shots or scoring well—but I know that I am not my score. I am not each shot. As a result, I’m much more relaxed and able to swing freely at the ball without fear. I play so much better when I’m not worried about whether I’m going to be able to hit that hole or make that putt. I just get up there and let it happen. It’s beautiful. Golf is always interesting to me, because I believe golf is a lot like life. Think about it. Sometimes you’re playing better than you should, so you learn how to deal with success. Sometimes you’re playing worse than you should, so you learn how to deal with failure. Sometimes you get good breaks you don’t deserve and sometimes you get good breaks you do deserve. Sometimes you get bad breaks you don’t deserve and sometimes you get bad breaks you do deserve. All in four and a half hours! Ha! And one of the best ways to get to know somebody is to play golf with them and watch how they behave. It says a lot about a person. In life, as in golf, sometimes we get so focused on outcome that we don’t enjoy the ride. We’re so uptight about the importance of the outcome that we miss the dance of life, the dance of relationships, the dance of the sales call, or the dance of doing a seminar. Mark Twain said, “Golf is a good walk spoiled.” I can’t say that I agree. 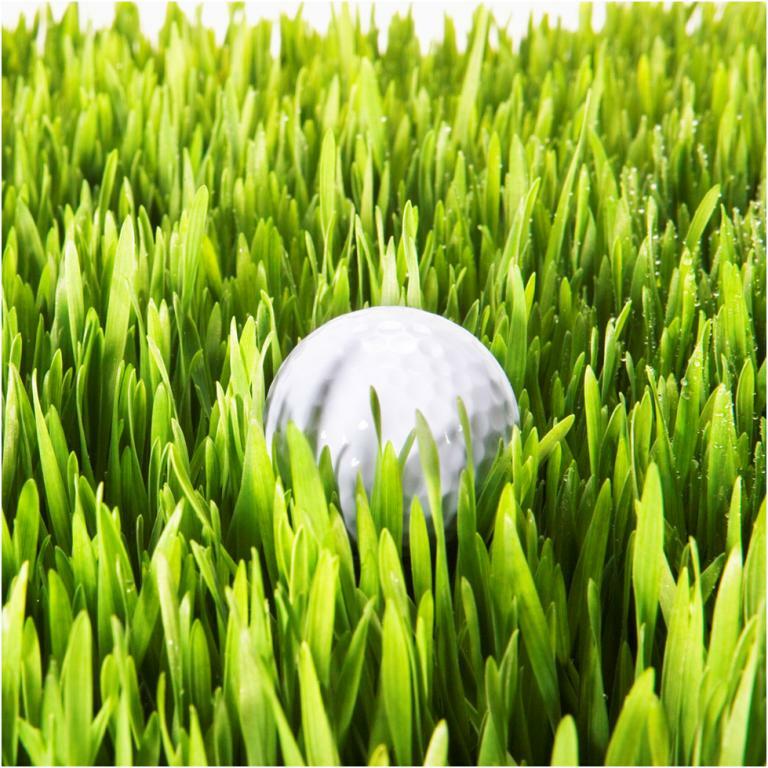 Golf is a wonderful game as long as you don’t start believing that who you are is dependent on how you score. Don’t get attached to outcome—just be who you are and you will be amazed at how much more you’ll enjoy the game of golf—and the game of life. 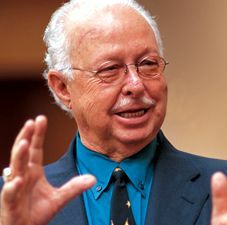 This has been a tough time for me, losing great friends like Steve Covey, Zig Ziglar, and now my friend and mentor, Paul Hersey. I had heard that Paul taught a fabulous course on leadership, so in December 1966 I went up to him in the hall and told him I’d love to sit in on his class the following semester. He said to me, “Nobody audits my course. If you want to take it for credit, you’re welcome to do that.” Then he walked away. I thought, That’s really something. I’ve got a Ph.D. and he doesn’t, and he wants me to take his course! So I went home and told Margie about it. I had to convince the registrar to let me into the course, since I already had a Ph.D. So I took the course and wrote the papers. So Paul and I sat down and wrote Management of Organizational Behavior: Utilizing Human Resources. It recently came out in its 10th edition and it sells more today than it ever has. It’s been a wonderful legacy for both of us. That was my start as a writer. If it weren’t for Paul Hersey, I wouldn’t be doing what I’m doing today. I owe so much to him. That book introduced Situational Leadership®, a leadership model that has been taught to hundreds of thousands of students since its inception. 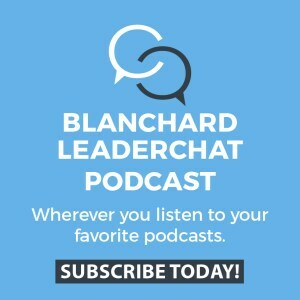 Even though The Ken Blanchard Companies now teaches Situational Leadership® II while Paul’s company, Center for Leadership Studies, has held on to the original Situational Leadership® model, we really have been “co-petitors” instead of competitors through the years because we valued each other and the way we thought. I’m so fortunate that Paul Hersey came into my life. I’ll miss him.